You can map attributes between entities that have an entity relationship. This lets you set default values for a record that is created in the context of another record. People could just navigate in the app to create a new contact record from scratch. But then they need to set the parent account and enter several items of information (such as address and phone information) which are probably the same as the parent account. This can be time consuming and introduces opportunities for errors. The easier way is to start with the account entity and, using the Contacts subgrid on the form, select + to add a contact. It will first guide people to look up any existing related contacts so they don’t accidentally create a duplicate record. If they don’t find an existing record, they can select New and create a new contact record. The new contact record form will include any of the mapped attribute values from the account (such as address and phone information) as the default values. People can edit these values before they save the record. When you map entity fields for a 1:N entity relationship certain items of data from the primary entity record will be copied into the new related entity form to set default values that people can edit before saving. These mappings only set default values to a record before it is saved. People can edit the values before saving. The data that is transferred is the data at that point in time. It isn’t synchronized if the source data later changes. These mappings aren’t applied to related records created using a workflow or dialog process. They aren’t automatically applied to new records created using code, although developers can use a special message called InitializeFrom (InitializeFrom Function or InitializeFromRequest Class) to create a new record using available mappings. 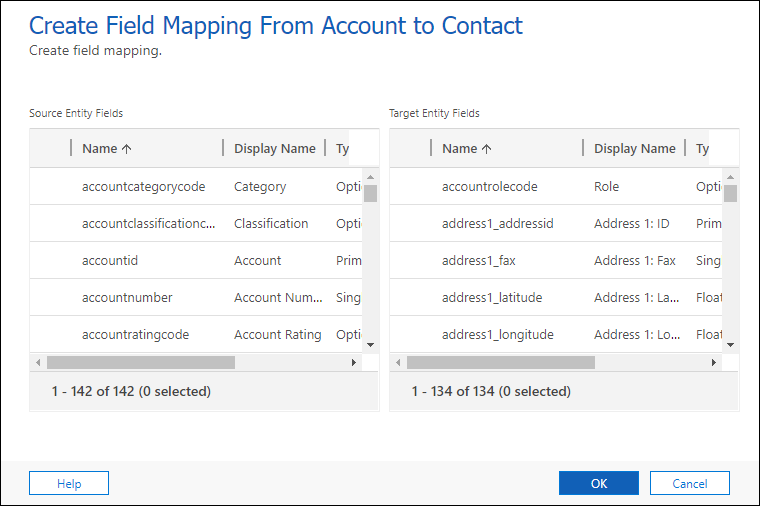 The only way to map entity fields is to use solution explorer. From the PowerApps portal select Solutions, and then on the toolbar, select Switch to classic. In the All Solutions list select the unmanaged solution you want. Mapping fields is done in the context of a 1:N or N:1 entity relationship, so first you need to view 1:N or N:1 entity relationships. Field mappings aren’t actually defined within the entity relationships, but they are exposed in the relationship user interface. Not every 1:N entity relationship has them. When you view a list of 1:N (or N:1) entity relationships for an entity, you can filter the relationships shown by type. You can select either All, Custom, Customizable, or Mappable. 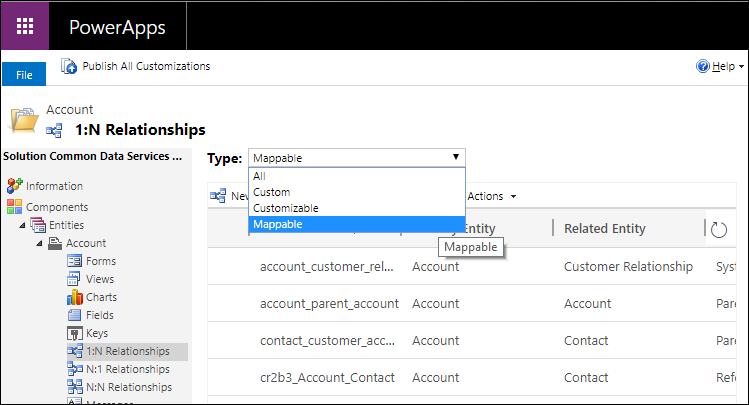 Mappable entity relationships provide access to allow mapping entity fields. When you open a mappable entity relationship, select Mappings in the left navigation. If there are any mappings that you do not want to apply, you can select them and click the icon. To create a new mapping click New in the toolbar. This will open the Create Field Mapping dialog. Select one source entity field and one target entity fields with values you want to map. Then select OK to close the dialog. The following rules show what kinds of data can be mapped. Both fields must be of the same type and the same format. The length of the target field must be equal to or greater than the length of the source field. The target field can’t be mapped to another field already. The source field must be visible on the form. The target field must be a field that a user can enter data into. Address ID values can’t be mapped. If you map to or from a field that isn’t displayed on a form, the mapping won't be done until the field is added to a form. If the fields are option sets, the integer values for each option should be identical. You can also generate mappings automatically by selecting Generate Mappings from the More Actions menu. You should use care when doing this with system entities. Use this when you create custom entities and want to leverage mapping. This removes any existing mappings and replaces them with suggested mappings that are based only on the fields that have similar names and data types. If you use this on a system entity, you could lose some expected mappings. For custom entities, it helps save time because you can more easily delete any mappings you don’t want and add any others that the generate mappings action didn’t create. Because field mappings are not metadata, you must publish them before changes take effect.